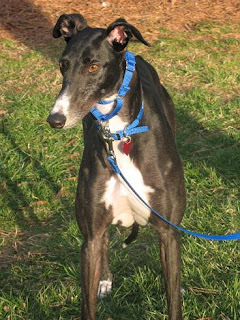 Well, it is official- we are the proud parents of a second greyhound, Blue Boy! You may recall pictures of Blue Boy from Super Bowl weekend when we were loving all over this super-cute black and white boy... but at the time, he was slated to go to a new home. He did in fact go to his new home, and he was there for a few weeks, when the owners decided that 12 hours per day was just too much for a dog to be left alone in a crate all day, and they contacted VAGA to return Blue to the group. Kenney and I had just tried to adopt Hank, a beautiful brindle boy that we were just in love with, but my allergies were terrible as soon as we brought him into the house. This of course meant that not only would we not be able to adopt Hank, but if we were going to foster a dog, it would have to be a black and white one. So, VAGA asked if we wanted to foster Blue Boy, and of course we agreed, so Kenney and I drove up on a Saturday to Fredericksburg to pick him up. Debbie asked if we wanted to foster him with intent to adopt, but we didn't want to go into the fostering with the idea that he was the one, so we said that we would just foster for the time being... we should have saved ourselves the time. Pretty much as soon as we brought him in the house, we knew that we wouldn't be able to let him go. Two days later, we were signing the adoption papers and putting them in the mail to Debbie. Blue has just been an amazing addition to our family... Ana is a little jealous of him, but she is slowly learning how to share. She is a very dominant female, and Blue is a scaredy-cat, so they really are a perfect pair. Ana is getting better about sharing. 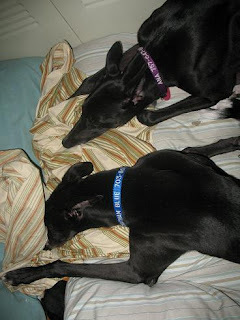 This was one of Blue's first nights with us, and Ana was doing the good big sister thing and keeping Blue company. I love how his face is kind of burried in the blankets! 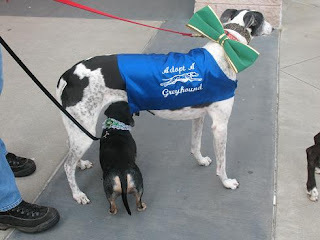 On Saturday, March 10, we had our first Richmond Meet and Greet at Petsmart in Virginia Center Commons. It was very successful!! 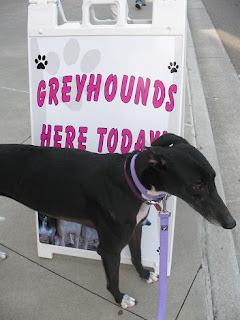 We handed out tons of business cards for VAGA and had such a big turnout of greyhounds, which was just fabulous! It was a lot of fun to see that many greys in one place again, it has been a while. Blue did very well... he is definitely an attention hound! He would hunt people down to get them to pet him. Ana could really care less, but she is a spoiled little West End girl now. She is teacher's pet at her Petsmart training class... but that is just because she is not too proud to sit on the hard concrete for some treats. She is so food motivated, it cracks me up!! Blue was the donation dog for this M&G- he did such a great job, much better than we actually expected!! 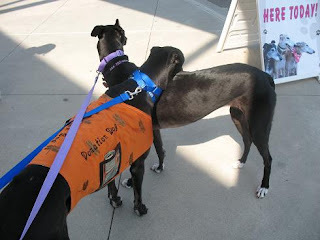 Trina and Jason brought their greyhound, Dana, and their two honorary greys, Dante & Shiloh... wait until you see the close-ups of their outfits! Mitch and Michelle were there with their two cuties, Maggie and Booyah... oh, Booyah!! Everyone loves him, he is such a heartbreaker, just like Hank. 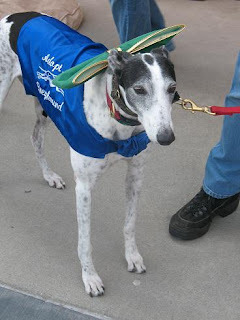 Here is Dana in her beautiful big green bow! She actually didn't seem to mind it very much. This is one of my favorite pictures from Saturday- Dante hanging out under Dana. If you look closely, you will see the cute little St. Patty's Day collar he had on!! 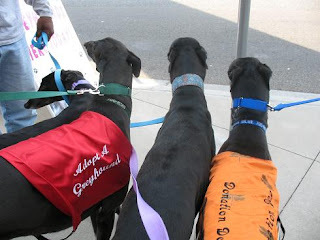 We had so many black greyhounds there that day, from left to right: Ana, Booyah, Logan and Blue. And then, of course, we had our cow-print dogs, Dana and Maggie. We kept having to tell people that they come in more than just the two colors! !